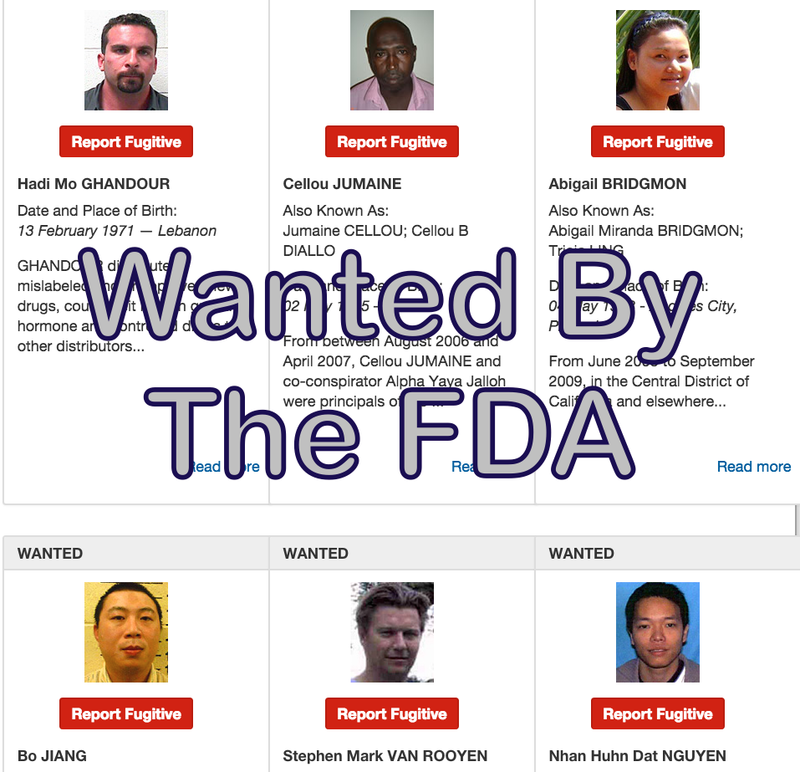 What Does It Take To Get On The FDA’s “Most Wanted” List? We all know that law enforcement agencies like the FBI and Interpol publish lists of fugitives wanted for things like murder, armed robbery, terrorism, and kidnappings. But did you know that the Food and Drug Administration also maintains a list of “Most Wanted” fugitives? The current FDA list contains a dirty dozen on-the-run suspects, wanted for a variety of reasons. Lest you think these are things like “putting undeclared soy in a protein bar,” a closer look at these allegations shows that these are some truly awful offenders. There’s Dushyant Patel, the former president of a North Carolina company called AM2PAT, which sold syringes pre-filled with the important anti-coagulant Heparin. Patel falsely claimed that his products had been made under approved, sterile methods. In fact, according to the FDA, he shipped Heparin needles without doing any sterility testing, resulting in the deaths of at least five people along with hundreds of hospitalizations for bacterial infections linked to the unclean syringes. Another FDA fugitive is Stephen Van Rooyen, who previously operated a Georgia company called Biomark International, selling stem cells and stem cell injections to treat Amyotrophic Lateral Sclerosis (aka “Lou Gehrig’s Disease”), Multiple Sclerosis, and other chronic diseases. According to the FDA, Van Rooyen and his accomplice Laura Brown used stem cells that were only intended for use on lab animals, but still charged patients between $10,000 and $32,000 per injection for treatments they said would cure these afflictions. In all, they raked in more than $1 million from this heartless deception. That’s nothing compared to the $12 million in bogus Lipitor tablets imported and manufactured by Pablo Manuel Fernandez back in 2002 and 2003. The FDA says Fernandez and his pals were making fake versions of the cholesterol-lowering drug in Costa Rica and Honduras, then illegally shipping the pills to the U.S. Fernandez, who already has a 1995 conviction for cocaine trafficking on his sheet, has been on the run for more than a decade. A more recent FDA fugitive is Nuritsa Grigoryan, who the FDA says wrote fake prescriptions, using a real doctor’s name and license number. Making matters worse, the alleged “patients” named on these prescriptions were actually victims of ID theft. Once these folks’ Medicare or Medicaid plans paid for the drugs, the pills were then funneled back to the pharmacies then sold on the black market. Grigoryan was convicted in 2014 on five felony charges and faces 35 years behind bars. Or at least she will if police ever find her. In Feb. 2014, she unlawfully removed her ankle monitor, obtained a passport from an Armenian consulate in California, and fled the country.